An NHS doctor left his family in the UK and joined the Islamic State militant group in Syria, the BBC has learned from leaked IS recruitment papers. Issam Abuanza, 37 – who gained a licence to practise medicine in the UK in 2009 – left his Sheffield home, his wife and two children in 2014. His sister Najla has told the BBC his parents will never forgive him. On social media, Dr Abuanza has said he wished that a Jordanian pilot burnt alive by IS had taken longer to die. On his Facebook page he is pictured wearing doctors’ scrubs and carrying a gun in a holster. He smiles as he raises his finger in the air – a symbolic gesture to represent the oneness of God that is commonly seen in the iconography of Islamic extremism. 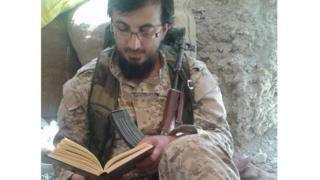 Another image shows him in combat fatigues, cradling an automatic rifle and reading the Koran. Dr Abuanza is a Palestinian doctor with British citizenship who spent seven years working for the NHS. 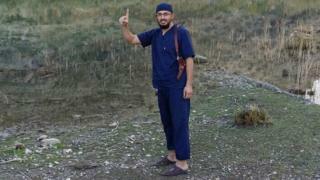 He is the first practising NHS doctor known to have joined the Islamic State group. Security minister John Hayes said IS “target vulnerable people”. The BBC has not been able to reach Dr Abuanza, who has not posted anything since October. He had crossed into Syria on 26 July 2014, soon after the creation of the Islamic State’s self-proclaimed caliphate. 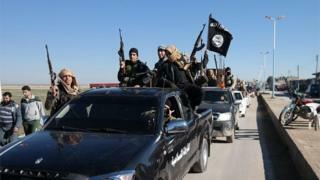 Like thousands of other recruits to IS he completed a registration document. In this, he told his handlers he was a doctor specialising in endocrinology – the treatment of hormonal imbalances. In Sheffield he had been combining shifts as a registrar with running an online clothing company selling kaftan dresses but had dissolved it three months before arriving in Syria. His wife did not want to be interviewed, telling the BBC that no-one, including her, had had any idea of his plans. Dr Abuanza had qualified as a doctor in Baghdad the year before the US-led invasion of Iraq in 2003. From May 2007 to July 2009 he worked at Glan Clwyd Hospital in Rhyl, North Wales, before moving around the UK with work. He has been confirmed as working at Scarborough Hospital between October 2012 and August 2013. During this time he posted an online video of himself praying in the doctors’ on-call room in the hospital. Scarborough and Whitby MP Robert Goodwill expressed his shock that “somebody who came to Scarborough to work in the health service, to save lives and make people better is now engaged in this dreadful enterprise”. During his time working in the NHS, Dr Abuanza had been an active user of medical forums on the internet in which he said foreign-born medics should leave behind their dignity, career and their future before coming to the UK because of the way the NHS treated them. It has not been possible to verify the authenticity of all of the IS recruitment papers seen by the BBC but many of the ones for British fighters have proved to be genuine. Dr Abuanza was not the only professional among the British recruits; a third of them went to university and three say they were teachers. The current whereabouts of Issam Abuanza are unknown, though in October 2015 he was living in Deir Ezzour province in eastern Syria. His startling journey from working the rounds in British hospital wards to the battlefields of Syria is yet another reminder of the dangerous appeal of Islamic State.